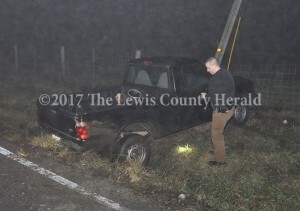 The Lewis County Sheriff’s Office is investigating three separate auto accidents in which the drivers left the scene before first responders arrived. The latest accident happened about 3:00 a.m. Sunday on Ky. Rt. 8 just east of Quincy. Deputy Eric Poynter said a 2002 Ford Ranger was apparently traveling west on Ky. Rt. 8 when the vehicle went off the left side of the roadway, traveled down a ditch and struck a utility pole guy-wire.